Of "The Pines", 107 South Street, Auburn, N. Y., is the son of James Sefton and Katherine M. Goodwin, and was born at Portwood, Stockport, County Chester, England, July 29, 1859. His father, a manufacturer, was of the families of Molyneux and Sefton, of the village of Sefton on the Irish Sea, County Lancaster, England. 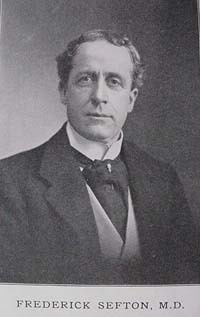 His mother, Katherine Molyneux Goodwin, is descended from the Goodwins of County Chester, and on her mother's side from the Molyneux family of County Hereford. Dr. Sefton pursued his studies under private tutors in England, at Pinkerton Academy in New Hampshire, and at Owen's College, in England. He also attended the Boston University, the College of Physicians and Surgeons at New York City and Yale University. This was supplemented by private hospital service in Massachusetts, followed by service in general hospitals in London and Paris. Subsequently he was senior medical officer at the State Asylum for Insane at Auburn, which position he resigned that his time might be devoted entirely to private practice and study in his chosen line of work, nervous and mental diseases. He has never been in general practice. Dr. Sefton is consulting Neurologist at the Auburn City Hospital, is a member and Ex-President of the Cayuga County Medical Society, a member of the Medical Association of Central New York, the New York State Medical Society, the American Psychological Association, the American Anthropometric Association, a Trustee of the Seymour Library at Auburn, Vice-President of the Auburn City Club and a member of the Lotos Club, of New York City. On June 3, 1890, Dr. Sefton married Miss Maude Fitch (1863-1951), of Auburn. She is the daughter of the late Charles P. Fitch (1830-1881), and granddaughter of the late Abijah Fitch (1799-1883) -- the latter one of the pioneers of Auburn. They have three children, Katherine (1891-1916), Wilfred (1892-1942), and Pennington (?-?). Dr. Sefton was also President of the Auburn Savings Bank, succeeding David M Dunning in 1932. The house built by Dr. Sefton known as "The Pines" still stands on South Street. The Sefton monument is located in the Cemetery's Consecration Dell section.